The Sentencing Council issued guidelines in 2014 on the sentencing of environmental offences to criminal courts. In 2015, 5 people received prison sentences for waste offences; the longest sentence was for 18 months. Last year, a landowner was given a curfew and 4 month suspended sentence for the illegal deposit, storage and sorting of waste. Before you panic, hazardous waste disposal doesn’t need to be a complicated or time consuming project for you. 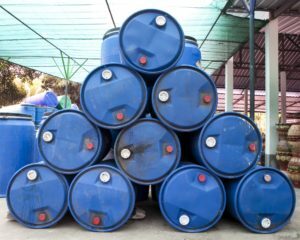 Having some understanding of hazardous waste will help you to be as efficient as possible when you are selecting the right waste management company for your needs. In this article, we will start with the basics and then explore how to deal with hazardous waste according to government regulation. Waste is considered hazardous when it contains substances or has properties that may cause harm to humans or the environment either immediately or over a period of time. So for example, a pesticide in a controlled environment is fine. However, it would be regarded as hazardous waste because, discarded anywhere, it could cause harm to humans or the environment. To minimise the potential harm of any hazardous waste, it is important that it is properly identified with the correct hazardous waste code by an independent. This code tells whoever is handling it what sort of hazardous waste they are dealing with so that they can arrange the correct methods of handling, storage and removal. 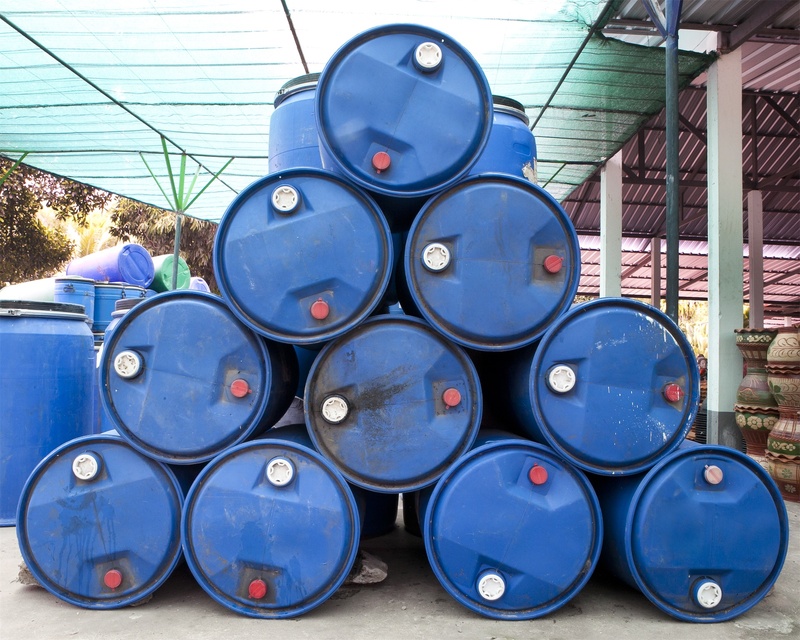 Understanding what constitutes hazardous waste is important as it’s not just the procedures that are different to normal waste stream, the cost of disposal is also different. This is due to the extra precautions necessary and the difficulty of processing it. Knowing what you are looking for is a vital part of dealing with hazardous waste. 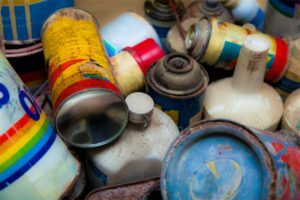 There are various types of hazardous waste ranging from the more obvious chemical waste and solvents to batteries and fridges that might seem harmless but may be dangerous if they aren’t disposed of properly. An independent survey of your site will provide identifying codes to your hazardous waste. Storing hazardous waste properly is important for three basic reasons: to avoid further contamination, to avoid it being stumbled upon accidentally and to make it easy to remove from the site. It might sound obvious, but safe storage of hazardous waste is the best way to avoid further complications. 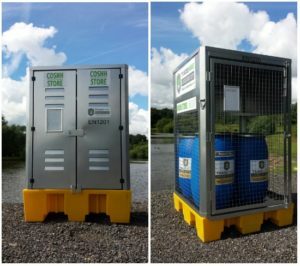 COSHH and drum stores are a popular and effective way of storing hazardous waste on construction sites as they are secure and stop the waste contaminating other wastes as well as the surrounding environment. COSHH stores are usually used to hold flammable liquids, solvents, chemicals and other hazardous liquids. Drums are more commonly used to store other wastes like aerosols, oily rags, mastics and paint tins. 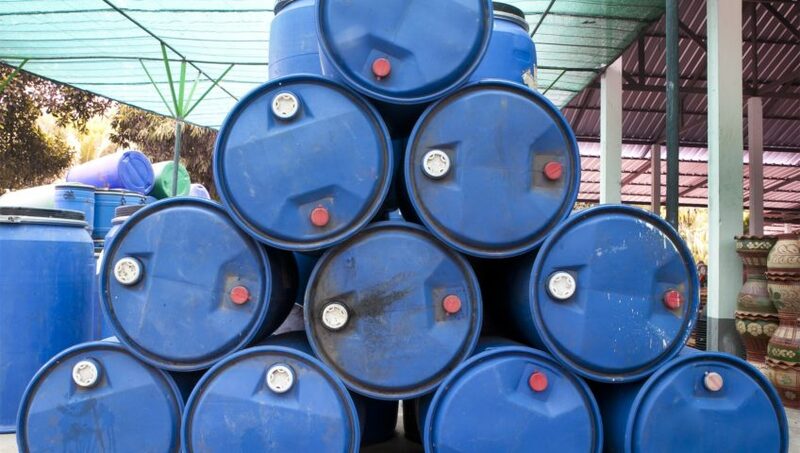 Drum and COSHH stores are both required to be bunded to contain any accidental leakages. Both containers can also be locked with padlocks to ensure the security of the hazardous waste. Following government guidance, drum and COSHH stores should have external noticeboards so that you can maintain an inventory of which types of hazardous waste are stored in the containers on site. This will also help the emergency services identify which hazardous wastes are on site should an incident occur. Storing hazardous waste onsite is only ever a temporary measure so using storage that can be moved and transported without any fuss is important for the smooth running of your site. As pictured below, some well designed COSHH and drum stores with forklift pockets are designed for this very purpose. In order to remove and dispose of hazardous waste, you must be registered as a waste carrier or use a company who are registered waste carriers. When choosing an authorised collection service to dispose of your hazardous waste, you must ensure the waste carrier has a licence to collect and transport the hazardous waste. In order to carry certain hazardous wastes you must have the correct license that states the necessary waste codes. The carrier must then take the waste to a facility with the correct environmental permits to receive, treat or dispose of the specific hazardous waste. To ensure the safe management of hazardous waste, there must be a traceable record of its composition and movements. A consignment note is essentially a paper or electronic record of the details of hazardous waste when it moves from place to another. It also details what the waste is composed of and who is handling it. It is your responsibility to fill out the relevant sections of the consignment note according to your responsibilities. If you are the producer of hazardous waste you will need to fill in sections A and B. Section A focuses on where the waste is going to and from, Section B is to describe the waste itself. Some materials may be separated from the hazardous element making it possible to recycle them. For example, metal from aerosol cans can be recovered in the recycling process if the can has been emptied first. Once the hazardous element has been removed, the waste can be recycled separately reducing the amount of waste going to recovery and landfill. If it is not possible to recycle the waste it is possible to recover some energy from the hazardous waste using either a boiler or an industrial furnace such as a cement kiln. An industrial furnace is made up of enclosed units that use thermal treatment to recover materials or energy from hazardous waste. A boiler is also an enclosed device that uses controlled flame combustion (fire) to create steam to capture the energy released. Another option is to use a secure landfill. In order to minimise any chance of hazardous waste being released into the environment and causing contamination, specially designed units are used to bury the waste. Secure landfills ensure that there is at least 3 metres of separation between the bottom of the landfill and the bedrock or groundwater table. Underneath the landfill, a double leachate collection system collects any water that has trickled through the landfill (leachate) and pumps it to a treatment plant. This reduces the amount of leachate in the landfill and minimises the potential for environmental damage caused by any contaminants found in this water. Once the landfill is full, an impermeable cap is put on top. This stops anything entering the landfill after it is complete. When properly handled, there is no reason for hazardous waste to cause you any problems. A good waste management company will advise and arrange the correct, storage and removal of your waste to ensure that you are fully compliant and that you don’t pay any more than you have to. They should also provide you with independent waste testing to ensure that your waste is given the correct code and therefore disposed of properly according to government guidelines.